Keep your damn shoes on! I have never been a foot person. Not that I think it matters much in this particular case, but I thought I should be open about this fact. I’m not exactly grossed out by them or anything, I’m just not a fan of how stinky and sweaty and, well, ok, gross they can be. My husband (and my ex before him) has been known to launch his dirty socks at me in an attempt to make me squeal in terror and run from the room. He, of course, thinks it’s funny as hell. Now, I realize some people keep their feet perfectly clean. I’m usually one of those people. But then again, I’m the sort of person who has to take a shower the second I wake up in order to avoid feeling all oogie, even when I haven’t sweated at all during the previous 24 hours. But I also know that not everyone is as concerned with hygiene as I am. I also know that while feet get “washed” every day, for most people I’m pretty sure that means just standing in the shower with water brushing the tops and bottoms as they shower. Most people don’t scrub their feet on a daily basis the same way they do their arms and legs. And feet get a lot more wear and tear then arms and legs. Especially in the summer when people are in sandals, Crocs and flip flops. After all, while regular shoes and socks make your feet sweat an awful lot (and therefore smell an awful lot), sandals and the like not only mean feet sweat, but that sweat is also mixed in with dirt and other unsavory bits. Feet carry icky fungi like athlete’s foot, ring worm and nasty toenail goop. Not that other body parts don’t carry their share of diseases, but feet infected by fungus spread that nasty stuff all over every place they walk. One of the first memories I have of college was going through orientation and being told by multiple student leaders to make sure I always wore flip flops in the shower to avoid such nastyness. I had images of fungus ingrained in my brain, so I pretty much wore my flip flops every second I was in the dorm. I bring all this up because the summer seems to breed more than just fungus. It breeds an absolute lack of good hygiene and good sense in people. Over the past few weeks, I have noticed a disgustingly large number of people participating in a variety of public activities without their shoes on. Now, I’m all for going barefoot in your own backyard. Heck, I don’t even mind it so much when you are in a public park, having a picnic on a blanket, surrounded by an ocean of grass. But there is a reason businesses put up signs that say things like, “no shirt, no shoes, no service.” It’s because going barefoot in 99% of public places is an actual public health issue and shouldn’t happen. But for some reason once the temperature rises a few degrees, there are certain people in this world who feel the need to strip their feet naked and run amongst us normal, shoe wearin’ folk. And I don’t like it one bit. A few weeks ago while sitting at my favorite cafe, I noticed a couple at one of the outside tables. The reason they were so memorable was because the man had his shoes completely off and propped up on the woman’s chair. This turned my stomach. Granted, I never eat at the tables outside (they only have two chairs and I never get to the cafe without at least one child in tow), but other people do. And here was this guy rubbing his feet, which could be carrying any degree of ick, all over the arm of the chair that someone not related to him was going to not only be sitting in later, but also eating lunch in. That is just wrong. I wanted to ask the man what in the world possessed him to think it was ok to disrobe his nasty, naked feet where people eat. Of all the places in the world feet probably shouldn’t be let out to breathe, I’m thinking anywhere with food is bad. To make matters worse, a few nights ago I went out to see a movie with friends. The theater was packed, so everyone was crammed in together. A couple decided to squeeze in to the empty seats next to me and while the girl went off to the concession stand, I noticed the guy slowly pulling his shoes out of his Crocs. I just wanted to scream at him. I mean, they are Crocs…they are full of holes. There is no way his feet could have been that hot. Just as I was noticing his feet rubbing against the ground near me, my BFF was pointing out the two guys next to him, both of whom had their shoes off too. Only these guys had their naked feet up on the rails in front of them. Rails that a great multitude of people would no doubt touch later on that evening. I just imagined all the possible diseases people could be picking up and transferring to their mouths as they grabbed the rail for support and then put popcorn into their mouths. I shudder thinking about it. Even worse was that I saw something moving behind my head and when I turned to look at the back row, there was yet another naked foot dangling. I was surrounded on all but one side. Thank God my BFF has the sense to keep her shoes on in social situations. Not only to keep them on, but to be thoroughly grossed out by the people around us. Just when I thought I was at my feet breaking point, today while at the children’s museum, I saw a kid, who was no doubt about 10 years old running all around the new exhibit without any shoes on at all. His mother was just sitting there, watching, not thinking anything was wrong with the situation. I was sort of amazed she had hers on. Either way though, I was grossed out. I don’t know what is going on out there, but put your shoes back on people. It’s not only gross, but a health hazard. There are health codes for a reason, please observe them. It will probably come as a bit of a shock to any regular blog readers of mine that I have not always been a huge ice cream person. I mean, sure, I love chocolate, but mostly in the form of cake, brownies and, well, chocolate bars and candies. While I never really turned ice cream down as a kid, it was never something I went all gaga about either. At birthday parties I always wanted a big ol’ slab of cake, but usually found myself passing up the ice cream, especially if it was chocolate. I know, it doesn’t make much sense, but until I hit my mid-20’s, the closest I got to chocolate ice cream was the occasional chocolate chip or cookie dough. Heck, even if someone was serving neapolitan, I opted for the strawberry and vanilla and left the chocolate for someone else. I know, I know, it doesn’t sound like me, but it really was. I actually can’t remember eating ice cream at all between the ages of about 11 and 18. I’m sure I had a bowl every now and then, but the closest I can clearly remember getting was stopping by TCBY, which happened to be near the theater I worked at for a treat (and it was vanilla with fruit on the top). It wasn’t really until I entered college and there was a mini-Baskin Robbins in our food court that I started eating ice cream again. And even then, it wasn’t until my senior year of college when I worked at the food court end of campus, and maybe once a week at most. However, in the last few years, I have discovered a love for the frozen treat. I think it started when I met two guys named Ben and Jerry. Or rather when I walked into their store near the movie theater we used to frequent. I found a flavor I adored: oatmeal cookie (still no chocolate). When I realized I could get it at the grocery store, my love affair officially began. It’s never a sustained love, more of bursts of strong passion every six months or so, but still, when the mood hits and I see a carton that sounds heavenly, I have to try it. During my last grocery run, I found two new flavors from B&J, both of which sounded heavenly. 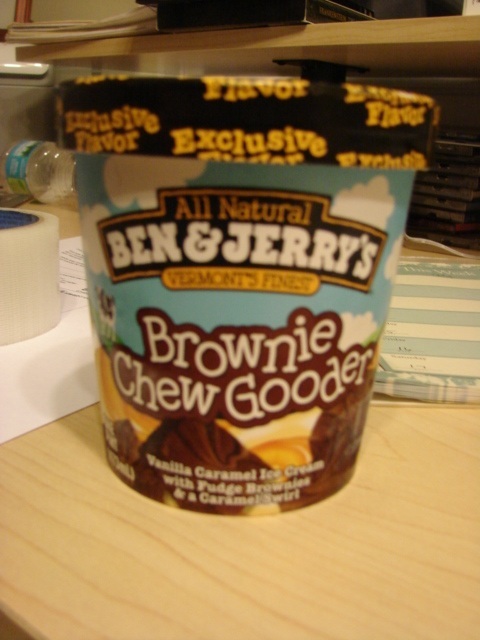 The first was Brownie Chew Gooder. 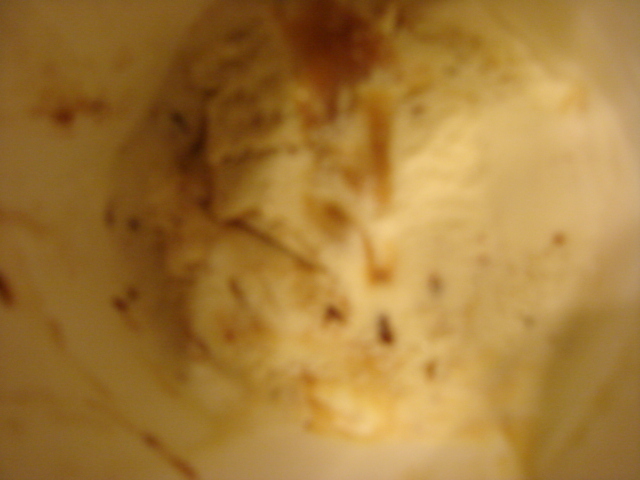 It promised vanilla ice cream with large brownie chunks and ribbons of caramel. I think it was worded a bit more eloquently than that, but you get the general idea. I wasn’t sure what they meant by brownie chunks exactly, but as brownies have always been on my top 10 chocolate treat list, I tossed a container into the cart. I was expecting little nuggets of brownies, and the carton did have plenty of those. What I was not at all ready for though, were the actual chunks…no, I think hunks would be a better way of describing them, of actual brownies. We are talking actual brownie squares. Not quite as big as I would cut myself from the pan, but definitely sized appropriately for my pre-schooler (who I am hesitant to give sweets to, yeah, I know, I’m a hypocrite at times). Now, the ice cream wasn’t swimming with these hunks, but I think I got at least five of them in the small package. And, they were fudgy, chewy brownies to boot. I’m not sure how they did it exactly, but even after being frozen in vanilla ice cream, those brownies retained their moist, chewy goodness. To add to my delight, the ice cream was decadently creamy. I could taste real cream in every single bite. Unlike some of the brands that claim to be extra churned for extra creamy taste, this stuff delivered the goods. Plus, the caramel was rich. My only complaint (other than the fact that 1/4 container has 250 calories, which just doesn’t seem fair for such a small amount) was that there weren’t enough hunks in it. I would have liked about twice as many. I’m a “save the best for last” kinda gal and I was really sad when I got to the bottom and there was nothing except tiny brownie slivers there. It left me with only a vanilla taste, and while I did love the creaminess of it, I really, really wanted one more fudgy bite. Still, it was pretty darn brownie-lific. When I was 13, I fell in love with Corn Nuts. I had just arrived at my 8th school in nearly as many years. My mother had once again gotten restless and decided we needed a change of pace, which really meant she needed some different scenery. So, we left the green pastures of the Country Meadows mobile home park for a large rental house about an hour away. I think that this move was provoked by the onset of “asthma.” I have no clue whether or not my mother actually had it but she convinced my step-dad and we packed up all over again. Not that I could tell anyone we lived in Country Meadows (which was in the middle of a large city which I don’t think had ever had anything resembling a meadow in it). Even though my mother liked to remind me that our home was not, in fact, mobile, she was far too worried that family members half-way across the country would imagine run down trailer parks and think less of her. It’s true, there was no easy way our house could have been mobile. It was much more akin to what people nowadays like to call a modular home than an actual trailer. The only way it was going anywhere was if it was removed by some major force and hauled off on a flatbed truck. Still, I guess just showing people a picture wouldn’t fix the problem, we had to keep silent about our abode. This latest moving bug struck my mother a few months after the start of my 8th grade year, so I had to say goodbye to the few decent friends I’d managed to make the year before when I moved to that school. By October we were on our way back down the hill to Walker Jr. High. Walker had four lunch options: bring your own, eat in the cafeteria, grab something from the fast lines or pony up to the counter at the student store. My mom was never good about stocking our pantry with things to pack in a lunch bag and since the school was in Southern California, there was no need to seek the refuge of the cafeteria (whose food was a grade above what I served my dog and had to be consumed in the dark, dank cafeteria proper). The quick lines weren’t bad since they were stocked with chips, Little Debbie’s and fries, but the lines were anything but quick. So, every day I opted for the student store, which had three food items: soda, candy bars and Corn Nuts. Soda and candy bars were .50 each, but Corn Nuts were 2 for .50, so each day I used $1 of the $2 I got for lunch to get a Pepsi and two bags of nacho cheese Corn Nuts. Was it healthy, of course not, but I was 13 and didn’t really care because it tasted good and meant I got to sock away $5 extra bucks a week. For years, Corn Nuts became my road trip snack of choice, but only if I could get the nacho cheese flavor. Otherwise I’d fall back on good ol’ beef jerky. I actually haven’t had them in years, but not because I stopped liking them. I just got on more of a health kick and realized they were not good for me, so I had to cut them out. Last week while checking out a local sweet shop, I came across a chocolate covered treat I hadn’t seen before that brought back a world of early teenage memories: chocolate covered Corn Nuts. So what does a chocolate covered Corn Nut actually taste like? Well, just what it says, a Corn Nut that has been covered in chocolate. 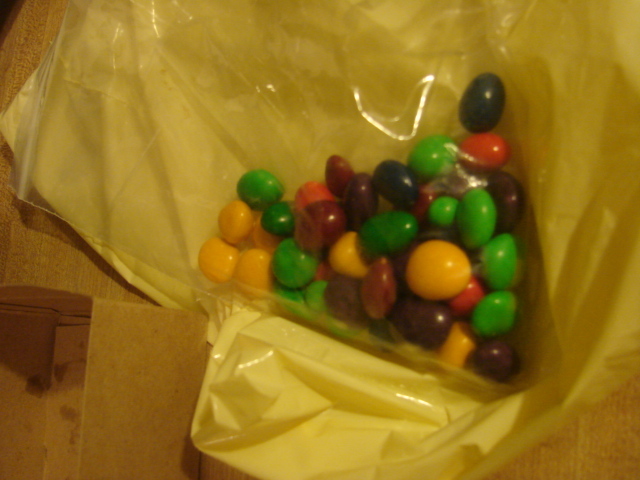 They look like M&M’s, so even though I knew what they were when I bought them, I still sort of expected a taste a bit more like a peanut M&M. They are an odd mix of crunchy salt mixed with chocolate. They have that sort of sweet and savory flavor that I often like. I’ve been known to top my goat cheese with fig comfit and to grab a handful of uber salty popcorn and chocolate covered peanuts together. They are admittedly a little off putting. They don’t cruch quite right. Instead, they crunch in that almost stale way Corn Nuts do. The chocolate surrounding the truckstop treat is thin, more of a candy coating. They are very much like M&M’s in that matter, only the chocolate shell seems to be made of slightly cheaper stuff, so it’s not quite as tasty. The first one made me cringe a little, but after a handful, I was sort of diggin’ on them. Not something I’d buy every day (or possibly ever again), but I will finish of the bag I bought. M&M’s are far tastier, so that’s what I’ll stick with, but the chocolate covered Corn Nuts are a fun departure from the norm and I’m glad I tried them. Price: N/A (obviously they weren’t free, but the bin they were in wasn’t labelled and I didn’t save the receipt). Last week was spent with my in-laws at the beach. I grew up on one coast and lived for a very short time on the other, so the beach is not something which easily impresses me. In fact, thanks to genetics, I have my mother’s very pale skin and light eyes, so that a day at the beach means either a can of 50 SPF sunblock or the ridiculous pain of a sunburn. And I hate putting sunblock on my face…it feels so very greasy. But since my MIL really wanted to have all of her grandchildren under one roof for the week and the trip would only cost the price of gas and one meal for the family, the trip was basically free. How in the world could I deny my son his first trip to the beach, even if I wasn’t thrilled about getting sand in everything and sweating under the South Carolina heat? My husband doesn’t do much in the way of cooking, but one thing he does amazingly well, is make frozen custard. A few years ago his folks gave him an ice cream churn that had belonged to his grandparents. It has a wooden tub and a metal dasher that everyone vies for in order to lick it when things are mixed and done. His mother insisted he bring it along with us to the beach, and somehow we managed to find just enough room for it (and it wasn’t easy, there was not an inch of space left in that trunk). Like I said before, my husband doesn’t experiment with much in the way of the kitchen, but he does go a little wild with the custard. I think the first batch he made was strawberry and it was good. Then he wanted to try blueberry, peach and rum raisin. The rum raisin was so powerful that it nearly knocked me out. Not something I’d want to serve to children, but all our friends wanted seconds. When his mom first mentioned the churn, I offered up some of these great flavors. What’s better in summertime than fresh fruit ice cream? However, in an attempt to make everyone happy, my MIL insisted on plain old vanilla. I was particularly disappointed since South Carolina is known for its peaches and we had a ton of fresh ones sitting right on the counter. But, there is no reasoning with her sometimes, so vanilla it was. I did get to add some hot fudge to it and that was great. But even without it, the custard was superb. And, a few nights later, we got our way and I started chopping peaches. I make a mean peach syrup to mix in with the custard and with some diced peaches to boot, it was the best possible treat. Everyone in the family raved about it. 2) Playing in the pool with my son. Another thing my MIL insisted upon was my son wearing the floaty bathing suit she bought him. It was pretty cute since it matched the one she bought one of his cousins. He didn’t actually need one since we had a floaty vest for him already, but she wanted to see him in it, so we agreed. I was actually upstairs with the baby when he first got in the pool but when I went down a few minutes later, my SIL was thrilled to take the little nipper and let me jump in. My son was so adorable! He not only had the floaty bathing suit on, but he also was in a floaty ring with a snorkel in his mouth and goggles on his head (not his eyes). He refused to talk except through the snorkel, which while hard to understand, was really, really funny! I’ve never gotten to play in the pool with him before. Usually my husband takes him in, but this time, we were both in and splashing around with him. He pushed off us, “swam” to the toys we threw for him and just generally had a ball laughing and playing with us. I’m not sure we’ve ever had more fun together. 3) RB’s restaurant. The only goal my husband had for the trip was to get some good seafood. He grew up in North Carolina and fell in love with what he calls the “fish camps,” which are fairly cheap fried seafood places. The plates come piled high with shrimp, oysters, clams, fries and hushpuppies. I don’t think his BIL quite understood what he meant when he said “fish camp,” since it definitely wasn’t a cheap place to eat, but despite that, the food was stellar. My husband stuck to fried shrimp and I had a mix of shrimp and oysters. Before we even left for the place, he told me he wanted shark for dinner. I knew there wasn’t going to be shark on the kid’s menu, but we ordered it while pointing to fried fish on the menu. The trick worked, because as soon as we got back to the beach house, all he could talk about was the yummy shark he had for dinner. We quietly told everyone the real story, which got laughs from all. The food was quite tasty. My favorite part was definitely the hush puppies. I’d had them plenty of times in my childhood, but growing up in the Midwest, my only exposure was Long John Silvers. It wasn’t until I went to one of these “fish camps” with my husband that I found out the true joy of sweet Southern hush puppies. It’s a good thing they only brought us one basket full, because my son claimed he didn’t like them and I might have eaten my body weight in them if given the chance! 4) Watching my son play with his cousins. While I was not always enamored with the noise created by seven kids under the age of 10, especially the noise made before 7 am each morning that woke us up, my son really bonded with his cousins. Well, at least one of them. He is smack dab in the middle of my family’s group of cousins. There are three older and three younger. Even though he was nice to his younger cousins, he quite obviously thought they were babies and while he wanted to play with their toys, he wasn’t as interested in playing with the actual kids. I think he did sort of fall in love with his only female cousin, who is 2 1/2 years older than he is. They were thick as thieves. Every game they played together. Every time one went in the pool, the other had to go in too. There were constant calls to either myself or my SIL for one to do something with the other. And, it seems to be a cry that has carried over into our non-vacation lives. Since they only live about 15 minutes from us, my son and my niece are constantly asking to play with each other. It’s really pretty cute. 5) And last, but not least: game night. I have great memories from my childhood of staying up late playing games with my folks and my grandparents. Every time we went to visit my grandparents, we ended up playing Pictionary or Chinese Checkers or some kind of card game. Many of the greatest moments from my childhood happened around my grandparents’ dining room table. At the beach, my SIL brought a copy of Scrabble. I hadn’t played in years, but got in on the first game. That night we started the frenzy. Since there were so many of us, we had to play in teams. I partnered up with my husband and the second night we kicked some major booty. The next night I played by myself and also took home the gold. The last night we played didn’t go quite as well. I joined the game already in progress (I was putting my son to bed). My husband had played a few rounds without me and he is just not quite the strategic player I am. He’s more about the words than the score. Once I got into the grove though, I pulled us up from last place. It was neck and neck. We ended up coming in second, losing by 3 points. It was a bit disappointing, but at least we gave it our all. Plus, I finally got them to stop consulting the dictionary before they laid their words down. Of course, I did almost have a throw down with my BIL when I mentioned to him (and his teammate my MIL) that they couldn’t use contractions or slang. He got quite annoyed with me, but luckily I had the support of all the other players, so that helped. I didn’t want to harp on the rules, but there are some basic ones that just have to be followed. And, since he is usually the rules police, I kind of liked setting him straight this time. All in all, it was an interesting trip. As a kid we never really went on vacations with my aunts and uncles, so it was a new experience for me. I won’t say I wasn’t thrilled to be home, because to go with my top 5 list, I could probably make a top 10 annoying things about vacation list (and may still). There is, after all, no place like home. Yeah, I know, the title is odd. And no, the fudge wasn’t made by any mermaids. At least, I don’t think it was since it had a little sign saying it was made by someone named Nancy. I guess she could have been some sort of merfolk relation. This time last week, I was just returning from a vacation adventure in South Carolina. My in-laws rented an enormous beach house and invited all three of their kids and their spouses and kids to stay with them. Having grown up on the coast, you’d think I’d be far more enamored of the beach than I actually am. I think it has to do with the pigmentation of my skin. I am the original pale, pale white girl. The sun does not shower me with golden kisses when I sit beneath its glory. It turns me a shocking shade of pink that can only be described using something from a Crayola box. I was excited about getting out of the city and hopefully relaxing a bit. Not that I got to relax all that much. Funny how a household of children (7 under the age of 10), even when outnumbered by adults (there were 9 of us) is simply not at all soothing. Amazingly, even though I had the youngest one there (my darling baby girl is only 3 months old), my two were definitely the best behaved all week. But I digress…this is, after all, a chocolate post. Aside from my silly dreams of relaxing by the pool while my kids napped, I also hoped that our trip would lead me to some exotic chocolates I hadn’t tried before. Unfortunately, much like my idea of resting, it seemed a variety of chocolates was also a figment of my imagination. I did find one source of non-prepackaged chocolates on the island, in the very back of a little beach store in the tiny beach “shopping” district. I know those aren’t the right words to pick since I don’t think four shops, an ice cream parlor, and three restaurants can be called any sort of district, but it’s all I had right at my disposal. There was more of a town area, but I couldn’t get to it without taking the car and actually driving over bridges and such. Since I had no idea where anything was, I went with what I could get easily, even if it wasn’t much. The shop called Island Mermaid, had a little sweet counter in the back. They served slushies, ice cream, soda and fudge. The temperatures were in the high 90’s all week, so just the five minute walk to the shops took the wind out of our sails and we were salivating over the idea of a drink. I bought a raspberry lemonade slushie for my son, husband and I to share. I think my son ended up drinking most of it, but the poor little guy was so much more tired than we were. There were about a dozen types of fudge, cut up into small squares sitting in a plexiglass box on the counter. I was torn because there really weren’t many flavors with chocolate (only chocolate, chocolate peanut butter and amaretto), but there were several non-chocolate flavors that sounded tasty. I probably should have gotten one of each, but I can’t eat fudge the way I used to. When I was a kid, I used to get a box of fudge from the fair every year. I usually got 12 pieces and ate them over the course of the following week. I made myself sick more than once, so over the years, I’ve kind of cooled it on the fudge. But, since this was my only chocolate connection, I felt the need to buy and try it. 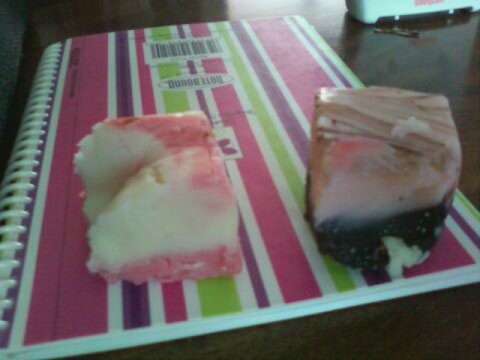 I only bought two pieces for myself: raspberry cheesecake and chocolate amaretto. The first one I tried was the cheesecake. It was super sugary. Even more so than I remember most fudge being. 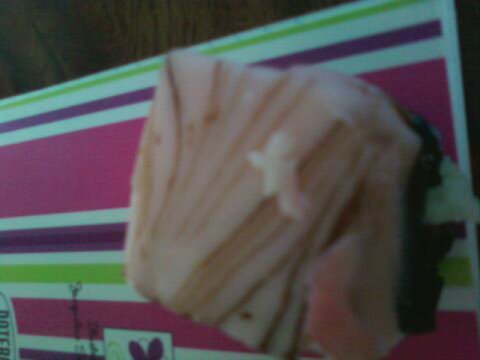 It had a “cheesecake” look with a white and pink swirl pattern. The bright pink reminded me of Pepto Bismal, and I’ll be honest, after I ate a few bites, I thought I might need some to settle my stomach back down. As I took my second bite, I could feel the sugar coating my teeth, which grossed me out a bit. The fudge did have real raspberry seeds in it, which made me believe there were some natural ingredient in the fudge, but it was odd to me since the taste was so artificial. Plus, there wasn’t much of a cheesecake taste. It just sort of tasted like imitation raspberry all the way through. I only was able to take about 4 bites before I gave up. The chocolate amaretto was a bit more of a success. It did help remind me that for me, fudge usually needs chocolate to be tasty (although I do sometimes like small bits of maple or butter pecan fudge). There was a slight alcohol hint and also a slight cherry one, which is odd since amaretto is an almond flavor, not a cherry one. I did like the cherry hint though. It was still sugary, but I think the chocolate gave it a slight richness than helped it from being too overwhelming. It did, however, leave an odd greasy feeling on my lips which I was not fond of. I was almost able to finish this piece though, so I felt that was a real improvement. Now, I only tried two pieces, but I was very underwhelmed. I wanted it to be good, especially since it was so cheap (about .85 cents per square), but in the end, it tasted cheap to me. I won’t give up on fudge, but it’ll have to be some good fudge to make me consider eating it again after this.